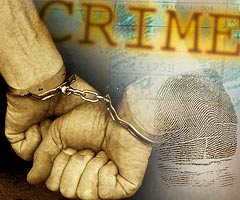 26-year-old Malaysian, Astro Jakaria (originally from Sabah, with no fixed address in Singapore), who has been accused of murdering 61-year-old transvestite, Abdul Khalid Othman in Ang Mo Kio last weekend, will be sent for psychiatric evaluation. According to investigations, it is also believed that Astro Jakaria did not act alone, and had the assistance of at least two other unknown men. 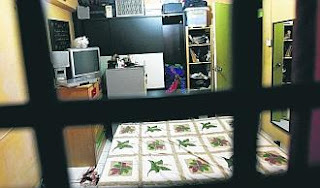 Abdul Khalid Othman, a Singapore permanent resident, was found dead on June 21 at his home, a two-room flat at Block 508 Ang Mo Kio Avenue 8. His murder is believed to have taken place sometime between Thursday and Saturday the week before. Unemployed Astro, who sports golden hair, was first charged in court last Monday after his arrest in a hotel in Geylang. While the psychiatric evaluation takes place, the case has been adjourned until July 21. If found guilty of the murder, Astro Jakaria faces the mandatory death penalty. When the transvestite victim was found, he was wearing only in his underclothes. The neighbours of the victim, who was employed as a cleaner, said that Mr Abdul had moved in to his apartment about five years ago and was usually seen wearing dresses and fashion accessories. 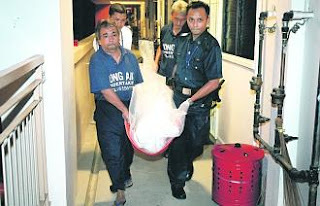 Mr Abdul was found dead in the bedroom of his two-room apartment in Ang Mo Kio Avenue 8. He had no visible injuries. He was known to share the ninth-floor apartment with a man in his early 30s and a woman in her 60s, who were seen leaving the scene of the crime with the police on the Saturday night after the body was discovered. Neighbours have been trying to make sense of why the man whom they regarded as a 'good neighbour' had been killed. Mr Danny Tan, 66, a retiree who lives in the flat next door, said that his wife had heard two loud shouts from Mr Abdul's flat on Thursday before last, at about 9.15pm. 'I did not hear from him after Thursday but I didn't expect this,' said Mr Tan. He added that he had not heard quarrelling in Mr Abdul's flat recently, although Mr Abdul was known to have male visitors stay over occasionally. Mr Abdul is believed to have been the owner of the apartment and slept in the bedroom while his two other tenants slept in the living room. Neighbours said that they are friends. Mr Abdul, who worked as a contracted cleaner at the SMRT Clubhouse in Bishan, had not reported for work since Thursday. The assistant manager of the clubhouse said that Mr Abdul was known to staff and club members as 'Bibi'. 'His contract manager informed me...that he was murdered and we were all taken aback,' he said. He said that Mr Abdul's son lived in Australia and was on his way back for the funeral. Police officers interviewed the assistant manager yesterday morning and collected closed-circuit TV footage from the clubhouse. 'As a colleague, he was always caring. He would even feed the stray cats in the neighbourhood,' said the assistant manager.